Bring the Pastry sheet to room temperature before spreading it. In a pan, heat Oil. Add Hing and Cumin seeds. Once the seeds turn light brown, add Onion & all the chopped vegetables. Fry on medium heat for 1-2 mins. Cover & cook till they soft. Add Paneer & all the dry masala powders. Mix well for a minute. Add Lemon juice & turn off the heat. Cover & keep aside to cool. Cut the pastry sheet into rectangle shape (any size you want. I usually make bite size). Place 1 tblsp of the filling in the center. Apply water at all the ends & fold into half. Press & seal the corners well. Place the prepared puffs on the baking sheet at 1" apart. 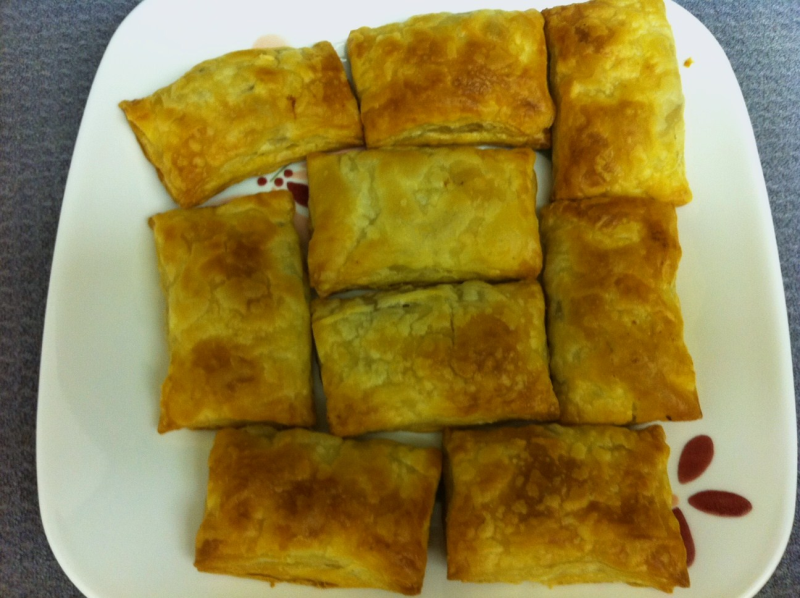 Preheat the oven at 400 F or 250 C. Bake the puff for about 10 mins or untill they are golden brown in colour. Serve hot or warm with ketchup.